I hope living here doesn't ever seem "normal" to me. Santa arrived at the Galleria at Sunset Mall in Henderson this week. It was the day after Thanksgiving to be exact. When I think of Santas at other malls, I imagine they arrive in sleighs, flanked by fake reindeer, elves, and a Mrs. Claus. The Las Vegas Santa arrived in a red vintage sports car, flanked by scantily clad, leggy "helpers" who did a little dance. And Santa had a French accent. No wonder kids here grow up and... Well grow up the way they do. I wish I could show you, but there aren't any pictures on our web site. 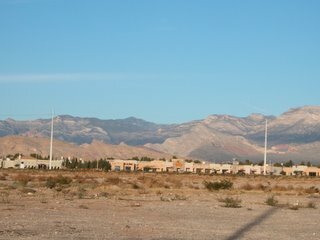 Above is the view looking west from the DMV. 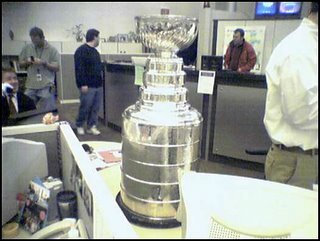 Also on the day after Thanksgiving, the Stanley Cup appeared at my job. There was an email, and then a page: "The Stanley Cup is in the newsroom if anyone's interested." As I was already in the newsroom, it was pretty easy to be interested. The trophy is on tour raising money for hurricane relief . Basically it's going to minor league games and people can pay $5 to take a picture with it. I took my picture with it for free. But it was on a disposable camera, so the pictures won't be developed for some time. I took some pictures of it with my phone. They're not great, but you get the point.